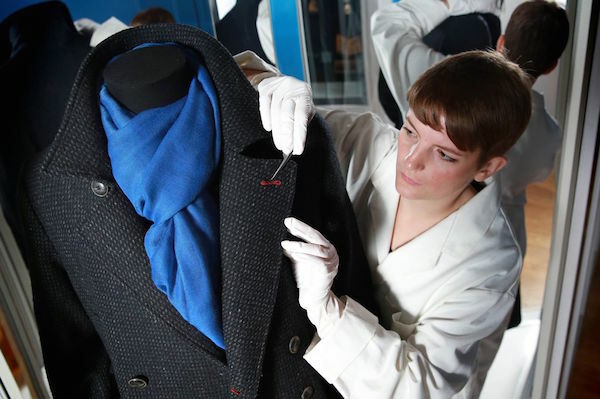 Can The Museum Of London Pin Down Sherlock Holmes? Pushing your way through a secret door hidden in a bookcase then making your way down a narrow corridor lit by flickering screens playing loops of the many adaptations of Sir Arthur Conan Doyle’s stories; there can be no better introduction to the Museum of London’s new exhibition: Sherlock Holmes – The Man Who Never Lived and Will Never Die. Interweaving the many depictions of Holmes in all his forms – from the early sketches by Sidney Paget in The Strand Magazine, through every film and TV incarnation of his character right up to the latest portrayal by Benedict Cumberbatch – this show delves deep into his psyche via paintings, historic photographs and hundreds of artefacts. London emerges as a vital character within the stories, too. The city’s murky underbelly is laid raw with visitors gaining a real sense of the swirling fog, criminal underclasses and the emerging technology used to solve heinous crimes. Prim and proper on the surface, the Victorians loved a bit of scandalous horror, and Sir Arthur Conan Doyle tapped directly into this prurient longing for murders, mysteries – and a darkly flawed but brilliant anti-hero to solve them all. 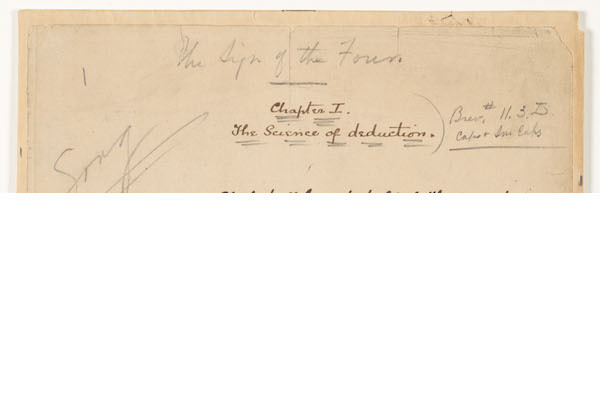 Split into thematic sections, the exhibition begins with a collection of Conan Doyle’s handwritten notebooks, kept while he practiced medicine in Southsea, which trace the development of a character he first called “Sherrinford Holmes” and his loyal sidekick, “Ormond Sacker”. Intricate displays of contemporary clothing, drug paraphernalia, cypher charts, theatrical makeup, violins, poisons, weapons, code books, capes and all manner of fascinating objects form a window into a tortured polymath – that peculiarly British kind of fractured genius that continues to enthral readers and audiences the world over. This eclectic array of items has been carefully gathered from the Museum of London’s extensive archives and loaned from private collections – indeed, many of the pieces have never been seen in public before. Juxtaposed with modern footage of cab rides tracing Holmes’ footsteps through London, we see the faces of Jeremy Brett, Cumberbatch et al brooding behind glass cases laden with memorabilia; the enduring appeal of the character is successfully hammered home. Predictably, perhaps, the door of Holmes’ fictitious lodgings at 221B Baker Street and the Belstaff coat worn by Cumberbatch in the Sherlock television series are the real bottlenecks of the exhibition, with people queuing for a seflie. The Museum of London has created a brilliant feast, with cabinets of curiosities to tempt everyone from the casual admirer to the most ardent fan of Sherlock Holmes. The exhibition manages to be delightfully unstuffy but never patronising; the theatrical adaptations are given equal prominence with the original manuscripts, and a Monet painting happily sits around the corner from a collection of postcards from ordinary Londoners, showing the mix of classes and races that made London the perfect setting for Conan Doyle’s thrilling stories. The final section of the exhibition is entitled “The Immortal Sherlock Holmes”, displaying J.M.W Turner’s 1804 painting of the Reichenbach Falls where Conan Doyle tried to kill off his most famous creation in ‘The Adventure of the Final Problem’ beside the manuscript of ‘The Adventure of the Empty House’, in which Holmes is revealed to have survived. The public simply could not deal with his death and, with his character still being reinterpreted, adapted and analysed, we could in fact say that the popularity of Sherlock Holmes is at its peak some 125 years after his creation. Sherlock Holmes: The Man Who Never Lived and Will Never Die is at the Museum of London until Sunday 12 April 2015.